Iroko is an exotic wood from Africa which takes on an appealing amber color in the sun. A beautifully proportioned, highly robust structure, with a 16cm wide façade and 24mm thick wood. 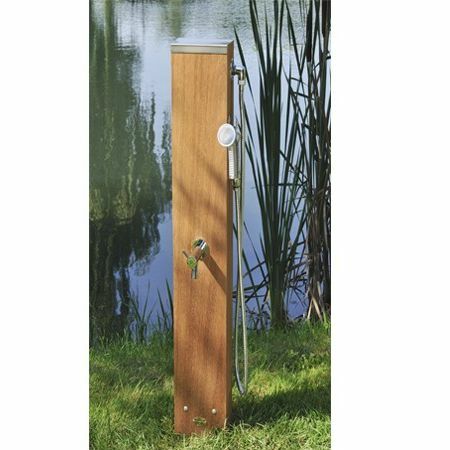 Its 1.00m height makes it a great alternative solution to the traditional tall shower. It is compact, enabling you to install it discreetly. This unit is fitted with a contemporary 1/4 turnfootwash faucet which serves as a water source and hand-held shower head. The water released by the little shower head provides an extremely gentle sensation to the skin, like being bathed in lots of refreshing soft foam.